So Good Afternoon! We are almost packed and ready to leave for OH! We plan to leave tonight after church so we go through Chicago at night. Some friends of our recently had a baby and her baby shower is Friday night when we are in OH but I’m going in on a gift with some others but said I would make the card so here it is! Cute huh!?? I’m not sure of the name Kathie but it is an awesome folder. I’ve used it for Christmas too! I’ll take a picture this weekend at the show and post it on Monday! Thanks for the info about the embossing folder. I’ve been looking for it since I saw a card made with it in your booth at the Springfield Massachusetts show. how do you make the card base? do you have the instructions of how to make it and the materials used? thnks. 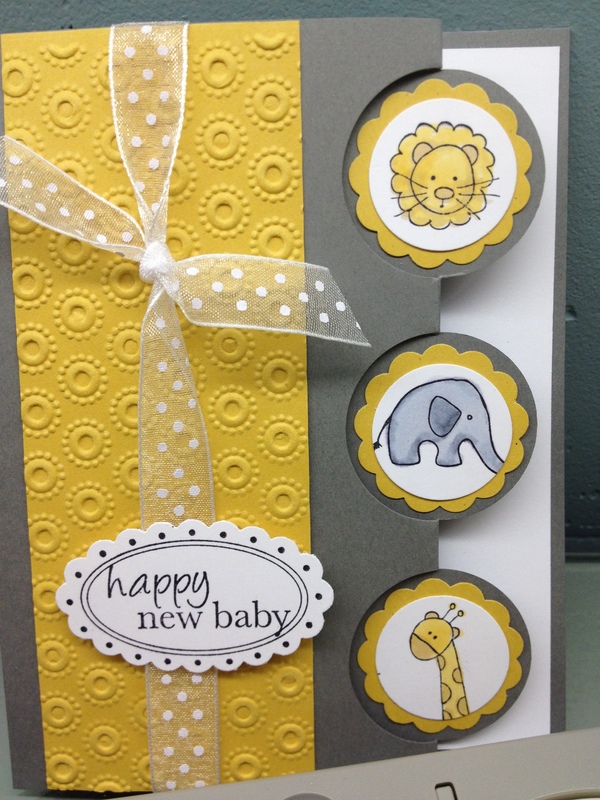 the cards are a pre-made Tripe Circle Card available on our website at http://www.shopec.com. The punches used were a 1″ circle and and 1.25″ scallop circle. Hope this helps!